Parents looking for games that educate as well as entertain their children this holiday season may want to consider trading cards games. Although youth are constantly stimulated by movies, video games and music, they may be missing out on a key component of cognitive and social development: constructive, interactive play. This is especially important for older, school-age children as it helps them build relationships and lifelong strategic thinking skills. 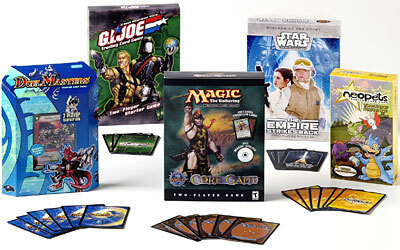 Trading card games foster constructive interaction and cooperation among the players. Introduced in the 1990s, this genre continues to be especially popular with youth who are looking for fun games to share with friends. And, parents are also embracing trading card games because they teach math and strategy skills while promoting social interaction. "Trading card games can help children develop important organizational and reasoning strategies," said Dr. Helen Boehm, psychologist and author of Fearless Parenting for the New Millennium and The Official Guide to the Right Toys. "In addition to providing a fundamental approach to divergent thinking and socialization, these interactive trading card games encourage creative planning and problem-solving skills." Trading cards are designed to engage the player's imagination and sharpen sound reasoning as the child becomes successful in playing the game. Not only do children learn new skills with these interactive card games, but it also provides parents with the opportunity to teach their children good sportsmanship and fair play. "Learning to respect rules, take turns and follow directions - all taught and reinforced during trading card game play - are time-tested and necessary skills for success in school and throughout life," said Dr. Boehm. Neopets Trading Card Game is an entry-level experience for 8-12 year olds and is a simple way to introduce the strategy and fun of trading card games. Based on the on-line world of Neopia, players use their favorite Neopets to compete in areas of strength, agility, and intelligence. Duel Masters Trading Card Game combines the artwork of some of Japan's finest artists with fast and intense game play that brings alive a dimensional realm of mighty and mysterious civilizations where players can battle and cast spells to break the other player's defense. MLB Showdown combines the fun of collecting sports cards with the strategy of trading card games. Acting as the manager and owner of the team, players can assemble the perfect squad, create starting lineups, and make the calls - from steals, squeeze plays, to going to the bullpen for late-inning relief. GI Joe Trading Card Game, based on the popular action figures, gives the player strategic control of the heroic GI Joe troops as they challenge the forces of Cobra. The Star Wars Trading Card Games hold all the characters and ships necessary to recreate the intensity and action of the Star Wars movies. Players can recreate light saber duels and space challenges based on their strategies and plans. With most trading card games, you can get started with a two-player game starter set, which includes two decks of trading cards (one for each player), a playing mat and detailed instructions. It also includes special accessories such as a die or coins that are unique to the specific game. As players become more familiar with their trading card game of choice, they can expand on their starter deck by adding cards from expansion or booster card sets. Adding these cards will allow players to personalize their decks to reflect their preferences for certain strategies and clever card combinations. With variations in rules and setup, there is simplicity balanced with strategy for all levels of play. Wizards of the Coast produces trading card game and tabletop roleplaying games.